For the first time, Massachusetts General Hospital (MGH) researchers have isolated egg-producing stem cells from the ovaries of reproductive age women and shown these cells can produce what appear to be normal egg cells or oocytes. In the March issue of Nature Medicine, the team from the Vincent Center for Reproductive Biology at MGH reports the latest follow-up study to their now-landmark 2004 Nature paper that first suggested female mammals continue producing egg cells into adulthood. "The primary objective of the current study was to prove that oocyte-producing stem cells do in fact exist in the ovaries of women during reproductive life, which we feel this study demonstrates very clearly," says Jonathan Tilly, PhD, director of the Vincent Center for Reproductive Biology in the MGH Vincent Department of Obstetrics and Gynecology, who led the study. "The discovery of oocyte precursor cells in adult human ovaries, coupled with the fact that these cells share the same characteristic features of their mouse counterparts that produce fully functional eggs, opens the door for development of unprecedented technologies to overcome infertility in women and perhaps even delay the timing of ovarian failure." The 2004 report from Tilly's team challenged the fundamental belief, held since the 1950s, which female mammals are born with a finite supply of eggs that is depleted throughout life and exhausted at menopause. That paper and a 2005 follow-up published in Cell showing that bone marrow or blood cell transplants could restore oocyte production in adult female mice after fertility-destroying chemotherapy were controversial; but in the intervening years, several studies from the MGH-Vincent group and other researchers around the world have supported Tilly's work and conclusions. These supporting studies include a 2007 Journal of Clinical Oncology report from the MGH-Vincent team that showed female mice receiving bone marrow transplants after oocyte-destroying chemotherapy were able to have successful pregnancies, delivering pups that were their genetic offspring and not of the marrow donors. A 2009 study from a team at Shanghai Jiao Tong University in China, published in Nature Cell Biology, not only isolated and cultured oocyte-producing stem cells (OSCs) from adult mice but also showed that those OSCs, after transplantation into the ovaries of chemotherapy-treated female mice, gave rise to mature oocytes that were ovulated, fertilized and developed into healthy offspring. "That study singlehandedly deflated many of the arguments from critics of our earlier Nature paper by showing that oocyte-producing stem cells exist in mice and could develop into fully functional eggs," says Tilly. Another paper from a west-coast biotechnology company, published in Differentiation in 2010, provided further independent confirmation of Tilly's earlier conclusions regarding the presence of oocyte-producing stem cells in ovaries of adult mice. "These follow-up studies, while providing definitive evidence that oocyte-producing stem cells exist in ovaries of adult female mammals, were not without their limitations, leaving the question open in some scientific circles of whether the adult oocyte pool can be renewed. For example, the protocol used to isolate OSCs in the 2009 Nature Cell Biology study is a relatively crude approach that often results in the contamination of desired cells by other cell types." To address this, the MGH-Vincent team developed and validated a much more precise cell-sorting technique to isolate OSCs without contamination from other cells. The 2009 study from China also had isolated OSCs based on cell-surface expression of a marker protein called Ddx4 or Mvh, which previously had been found only in the cytoplasm of oocytes. This apparent contradiction with earlier studies raised concerns over the validity of the protocol. Using their state-of-the-art fluorescence-activated cell sorting techniques, the MGH-Vincent team verified that, while the marker protein Ddx4 was indeed located inside oocytes, it was expressed on the surface of a rare and distinct population of ovarian cells identified by numerous genetic markers and functional tests as OSCs. To examine the functional capabilities of the cells isolated with their new protocol, the investigators injected green fluorescent protein (GFP)-labeled mouse OSCs into the ovaries of normal adult mice. Several months later, examination of the recipient mouse ovaries revealed follicles containing oocytes with and without the marker protein. GFP-labeled and unlabeled oocytes also were found in cell clusters flushed from the animals' oviducts after induced ovulation. 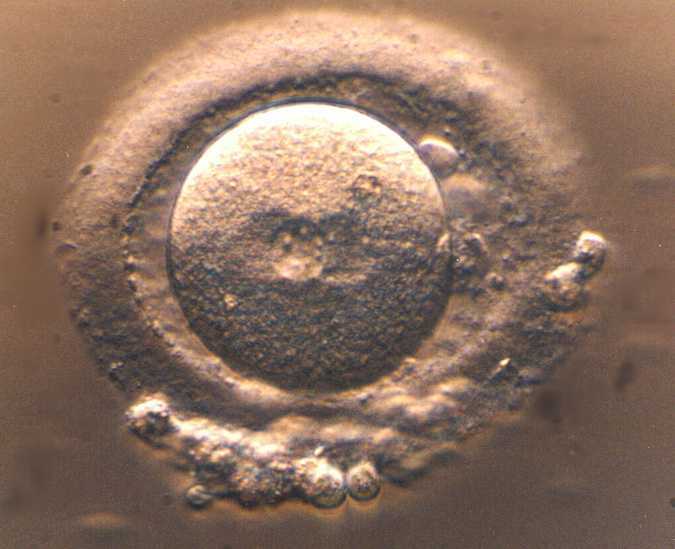 The GFP-labeled mouse eggs retrieved from the oviducts were successfully fertilized in vitro and produced embryos that progressed to the hatching blastocyst stage, a sign of normal developmental potential. Additionally, although the Chinese team had transplanted OSCs into ovaries of mice previously treated with chemotherapy, the MGH-Vincent team showed that it was not necessary to damage the recipient mouse ovaries with toxic drugs before introducing OSCs. In their last two experiments, which Tilly considers to be the most groundbreaking, the MGH-Vincent team used their new cell-sorting techniques to isolate potential OSCs from adult human ovaries. The cells obtained shared all of the genetic and growth properties of the equivalent cells isolated from adult mouse ovaries, and like mouse OSCs, were able to spontaneously form cells with characteristic features of oocytes. 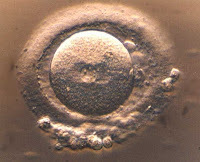 Not only did these oocytes formed in culture dishes have the physical appearance and gene expression patterns of oocytes seen in human ovaries – as was the case in parallel mouse experiments – but some of these in-vitro-formed cells had only half of the genetic material normally found in all other cells of the body. That observation indicates that these oocytes had progressed through meiosis, a cell-division process unique to the formation of mature eggs and sperm. The researchers next injected GFP-labeled human OSCs into biopsied human ovarian tissue that was then grafted beneath the skin of immune-system-deficient mice. Examination of the human tissue grafts 7 to 14 days later revealed immature human follicles with GFP-negative oocytes, probably present in the human tissue before OSC injection and grafting, as well as numerous immature human follicles with GFP-positive oocytes that would have originated from the injected human OSCs. "These experiments provide pivotal proof-of-concept that human OSCs reintroduced into adult human ovarian tissue performed their expected function of generating new oocytes that become enclosed by host cells to form new follicles," says Tilly, a professor of Obstetrics, Gynecology and Reproductive Biology at Harvard Medical School and chief of Research at the MGH Vincent Department of Obstetrics and Gynecology. "In this paper we provide the three key pieces of evidence requested by those who have been skeptical of our previous work," he adds. "We developed and extensively validated a cell-sorting protocol to reliably purify OSCs from adult mammalian ovaries, proving once again that these very special cells exist. We tested the function of mouse oocytes produced by these OSCs and showed that they can be fertilized to produce healthy embryos. And we identified and characterized an equivalent population of oocyte-producing stem cells isolated from adult human ovaries." Among the many potential clinical applications for these findings that Tilly's team is currently exploring are the establishment of human OSC banks – since these cells, unlike human oocytes, can be frozen and thawed without damage – the identification of hormones and factors that accelerate the formation of oocytes from human OSCs, the development of mature human oocytes from OSCs for in vitro fertilization, and other approaches to improve the outcomes of IVF and other infertility treatments. Researchers from Denmark, Scotland and the USA have created synthetic versions of a protein, which manipulates adult cells – such as skin cells – so that they can subsequently revert to an earlier, embryonic like state. These reverted cells have the potential to become any cell in the body. "Our discovery is an important step towards generating and maintaining stem cells much more effectively," says Professor Joshua Brickman, affiliated with both The Danish Stem Cell Center (DanStem), University of Copenhagen and Medical Research Council Centre for Regenerative Medicine at the University of Edinburgh. "Embryonic stem cells are characterized, among other things, by their ability to perpetuate themselves indefinitely and differentiate into all the cell types in the body – a trait called pluripotency. But to be able to use them medically, we need to be able to maintain them in a pure state, until they're needed. When we want to turn a stem cell into a specific cell, such as insulin producing beta cell, or a nerve cell in the brain, we'd like this process to occur accurately and efficiently. This will not be possible if we don't understand how to maintain stem cells as stem cells. As well as maintaining embryonic stem cells in their pure state more effectively, the artificially created Oct4 was also more effective at reprogramming adult cells into so-called induced Pluripotent Stem cells, which have many of the same traits and characteristics as embryonic stem cells but can derived from the patients to both help study degenerative disease and eventually treat them." If scientists can exploit this programming of stem cell programs, it will improve the ability to generate stem cells directly from a patient. These cells could in turn potentially be used for individualized studies and for developing individualized therapies for degenerative diseases such as type-1 diabetes and neuro-degenerative diseases. The Danish Stem Cell Center opened in the summer 2011 as a hub for international basic, translational and early clinical stem cell research. Professor Brickman and his group joined DanStem in October 2011 to partake in the build-up the center. DanStem address basic questions in stem cell and developmental biology, and develop novel stem cell based therapeutic approaches for diabetes and cancer. It is supported by two major grants from Novo Nordisk Foundation (DKK 350 million (€ 47 million)) and the Danish Research Council for Strategic Research (DKK 64.8 million (€ 8.7 million)), respectively. The MRC Centre for Regenerative Medicine (CRM) is a world leading research center based at the University of Edinburgh. Together we study stem cells, disease and tissue repair to advance human health. Our research is aimed at developing new treatments for major diseases including cancer, heart disease, diabetes, degenerative diseases such as multiple sclerosis and Parkinson's disease, and liver failure. RNA editing is a normal but not yet fully understood process in which small nucleotide changes occur after DNA has been transcribed into RNA. It is an integral step in generating diversity and plasticity of cellular RNA signature as a post-transcriptional event that recodes hereditary information. RNA editing is an important area in the post-genomic era for its role in determining protein structure and function. It has become increasingly important in genetic research. Last year, a study published in Science (Li, et al. Science, May 19, 2011) reported a large number of sequence differences between mRNA and DNA in the human transcriptome. This finding was startling because it implied that there might be a still undiscovered mechanism of 'RNA editing' that could disrupt the central dogma and affect our understanding of genetic variation. However, this view was strongly contested by other scientists because of the technical issue and lack of academic rigor, such as sequencing error or mis-mapping. In this latest study, BGI researchers developed a more rigorous pipeline for approaching these problems and answered some of the concerned questions, which contributed to paving way for the further studies of this field. They obtained the whole-transcriptome data by RNA-seq from a lymphoblastoid cell line of a male Han Chinese individual (YH), whose genome sequence was previously reported as the first diploid genome of Han Chinese. RNA-seq, also known as "Whole Transcriptome Shotgun Sequencing", is a recently developed approach on transcriptome profiling that uses deep-sequencing technologies with the advantages of high-throughput data, low background, high sensitivity and repeatability. In a paper published in 2009 in Nature ReviewsGenetics, RNA-seq is referred to as a revolutionary tool in transcriptomics. "These findings demonstrate this multifilter molecular pipeline is an excellent approach in this study," said Peng. "With the multiple filters, false positive results can be controlled or eliminated while identifying RNA editing events, providing a more accurate and effective method to extensively analyze RNA editing. We now plan to apply this new methodology to larger-scale deep sequencing studies for more comprehensive analysis and profiling of editome, including studies with additional physiologically relevant samples." "The evidence of extensive RNA editing identified in a human transcriptome underscores the necessity of an effective method to fully detect these events in order to further advance our understanding of human development and normal pathophysiological condition," said Jun Wang, Executive Director of BGI. "With continual improvement of the new approach, we believe this could be achieved in the near future." BGI was founded in Beijing, China on September 9th, 1999 with the mission of being a premier scientific partner to the global research community. The goal of BGI is to make leading-edge genomic science highly accessible through its investment in infrastructure that leverages the best available technology, economies of scale, and expert bioinformatics resources. BGI, and its affiliates, BGI Americas, based in Cambridge, MA and BGI Europe, based in Copenhagen. Denmark, have established partnerships and collaborations with leading academic and government research institutions as well as global biotechnology and pharmaceutical companies, supporting a variety of disease, agricultural, environmental, and related applications. BGI has established a proven track record of excellence, delivering results with high efficiency and accuracy for innovative, high-profile research which has generated over 170 publications in top-tier journals such as Nature and Science. These accomplishments include sequencing one percent of the human genome for the International Human Genome Project, contributing 10 percent to the International Human HapMap Project, carrying out research to combat SARS and German deadly E. coli, playing a key role in the Sino-British Chicken Genome Project, and completing the sequence of the rice genome, the silkworm genome, the first Asian diploid genome, the potato genome, and, most recently, 1000 genomes and human Gut meta-genome. In a study to be presented today at the Society for Maternal-Fetal Medicine's annual meeting, The Pregnancy Meeting™, in Dallas, Texas, researchers will report that early transplantation of human placenta-derived mesenchymal stem cells into the lateral ventricles of neonatal rats with birth-related brain damage is possible, and that the donor cells can survive and migrate in the recipient's brain. The study was designed to have the rat's brain damage mimic brain injury in infants with very low birth weight. The majority of neonatal encephalopathy cases is found in infants with a very low birth weight, and includes both hypoxia-ischemia and inflammation, a double-hit. Approximately 63,000 infants are born in the United States with a very low birth weight (one to five percent of all live births). In order to understand the effect of such a double-hit insult in very premature infants, this study, Early Intracranial Mesenchymal Stem Cell Therapy After a Perinatal Rat Brain Damage, was undertaken to investigate the neuroprotective effects of mesenchymal stem cells therapy on postnatal rats, whose injury was designed to mimic brain injury in infants with a very low birth weight. "Stem cells are a promising source for transplant after a brain injury because they have the ability to divide throughout life and grow into any one of the body's more than 200 cell types, which can contribute to the ability to renew and repair tissues," said Martin Müller, MD, with the University of Bern, Obstetrics and Gynecology, Bern, Switzerland, and one of the study's authors. "In our study, the donor cells survived, homed and migrated in the recipient brains and neurologic improvement was detected." A University of Minnesota-led research team has proposed a mechanism for the control of whether embryonic stem cells continue to proliferate and stay stem cells, or differentiate into adult cells like brain, liver or skin. The study gives researchers a handle on how those two competing processes might be controlled. It was performed at the university's Hormel Institute in Austin, Minn., using mouse stem cells. The researchers, led by Hormel Institute Executive Director Zigang Dong and Associate Director Ann M. Bode, have published a report in the journal Nature Structure and Molecular Biology. "This is breakthrough research and provides the molecular basis for development of regenerative medicine," said Dong. "This research will aid in the development of the next generation of drugs that make repairs and regeneration within the body possible following damage by such factors as cancer, aging, heart disease, diabetes, or paralysis caused by traumatic injury." The two enzymes are part of a "bucket brigade" of signals that starts when a chemical messenger arrives from outside the embryonic stem cells. Chemical messages are passed to inside the cells, resulting in, among other things, the two enzymes swinging into action. The researchers also discovered how the enzymes control Klf4. They attach a small molecule – phosphate, consisting of phosphorus and oxygen – to Klf4. This "tag" marks it for destruction by the cellular machinery that recycles proteins. Further, they found that suppressing the activity of the two enzymes allows the stem cells to maintain their self-renewal and resist differentiation. Taken together, their findings paint a picture of the ERK1 and ERK2 enzymes as major players in deciding the future of embryonic stem cells – and potentially cancer cells, whose rapid growth mirrors the behavior of the stem cells. "Although the functions of Klf4 in cancer are controversial, several reports suggest Klf4 is involved in human cancer development," Bode said.